...Or dressed up with crisp-cornered glossy papers, and a waterfall of ribbon. Which would you prefer? Much as I like the natural look, for the holidays, I like my presents to look glamorous under the tree; to look so breath-taking that I might hesitate for just a fraction of a second before tearing into them. Now that our tree is up, it is looking rather forlorn without a stack of brightly coloured packages stacked below. We better get settled and start wrapping all those gifts from our early shopping adventures. Of course, you can believe that I scoped out some of the most gorgeous gift dressings on etsy. 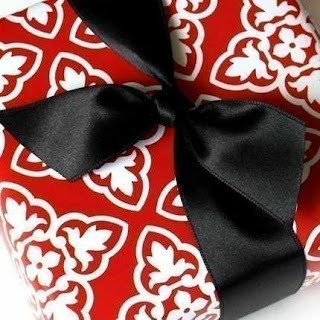 First up, from ErinReese is this traditional flat sheet wrapping paper in a bright, traditional red with a fabulous graphic. It is printed on a thick sheet (I loathe thin wrap.... it wrinkles and rips far too easily! ), with soy based inks. It is also 60% recycled paper. Gorgeous and eco-conscious? Love it. If you like one stop shopping, this shop is also stocked with satin ribbons in an array of matching colours. If you prefer to use a plain coloured paper, and let your ribbon do the talking, try this printed french cotton ribbon. 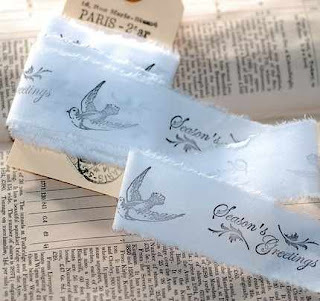 This wonderful, shabby chic ribbon comes from FrenchFleaMarket. Oh, wouldn't it be lovely layered over a wider, solid coloured ribbon? Maybe you have a few little presents that are difficult to wrap? Or maybe you just have trouble with getting the paper to meet up just right, and the tape to not wind itself around your fingers? Premade giftboxes are a godsend for cases like this. 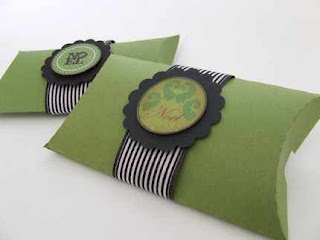 Try these beautiful forest green pillow boxes by BlueMoonCreation. They are even ribboned and embellished to save you all trouble. To make sure that little Johnny doesn't end up with Uncle Bob's bottle of whiskey, make sure you tag all your gifts clearly. 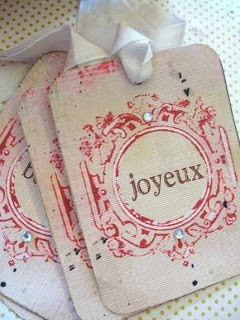 I love these pretty vintage look tags from PaperEclectiques. 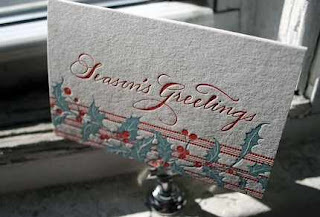 And finally, if you are in need of a stylish card, maybe to tuck a gift certificate in, look for letterpressed cards. Letterpress makes me swoon. Cards made by smockpaper rate extremely high in my list of favorites. You know, I think that we have actually made our way through the list of gruelling tasks we need to complete for the holidays. From here on, we can concentrate on being festive. Tomorrow, we will plan a Christmas party or two. I love the pillow boxes!